In Mexico, young Miguel Rivera grows up with an extended family who are all shoemakers. Miguel has a love of music. However, because his great-great-grandfather abandoned the family to take up a life as a musician, music has been banned in the Rivera household. Miguel is forced to watch videos of his idol, the singing/acting superstar Ernesto de la Cruz in secrecy, while trying to imitate his style with a homemade guitar. A mariachi whose shoes Miguel shines urges him to enter the singing competition held this Day of the Dead in the town square. However, when Miguel’s grandmother finds him with the guitar, she breaks it and insists that he take up the family profession of shoemaking. The only photo of Miguel’s great-great-grandfather, which has its face torn off, falls from the ofrenda and Miguel finds that it has been folded to hide where it shows him holding a guitar – the same guitar that Ernesto de la Cruz used. Miguel realises that Ernesto de la Cruz must have been his great-great-grandfather, He sneaks into Ernesto de la Cruz’s crypt and takes his guitar to go to the competition. However, because he has stolen from the dead, he now finds he has become ghost-like. He wanders into the Land of the Dead where he finds that he will be trapped there if he does not return before dawn when the Day of the Dead ends. The only way to do so is for one of his family to give their blessing and send him back but his great-great-grandmother will only do so on the condition that he renounces music. Refusing to do so, Miguel sets out on a quest across the afterlife to find Ernesto de la Cruz, his great-great-grandfather, and get his blessing. Coco was the nineteenth animated film from Pixar. It follows Toy Story (1995), A Bug’s Life (1998), Monsters, Inc. (2001), Finding Nemo (2003), The Incredibles (2004), Cars (2006), Ratatouille (2007), Wall-E (2008), Up (2009), Brave (2012), The Good Dinosaur (2015) and Inside Out (2015), along with assorted sequels to these. It Coco was one of the few non-sequels works the studio has made into the 2010s. Coco is a film set around the Mexican Day of the Dead. It has a number of similarities to the earlier-released The Book of Life (2014), which also featured a venture into the afterlife on the Day of the Dead and a young hero who wanted to defy his chosen profession and become a musician. Director Lee Unkrich (who has no Mexican background) states how he initially wanted to make a film about a white kid discovering Mexican culture. Perhaps mindful of how much of an angry uprising there has been against the issue of ‘whitewashing’ – rewriting ethnic roles with white Hollywood actors – cultural appropriation and white saviour tropes in recent years – Disney’s appalling treatment of Polynesian culture in the recent Moana (2016) is an example that immediately comes to mind – Pixar discarded this approach. Instead they went with a wholly Mexican-centred production, right down to every single member of the voice cast being Mexican (something that The Book of Life, which did have a Mexican director, never actually did) and employing Mexican-American Pixar employee Adrian Molina as co-director. As Wikipedia notes, this makes Coco the biggest budgeted all-Mexican cast film ever made. I am not Mexican and lack enough familiarity with the culture to feel qualified to the extent to which Coco pays respect to Mexican culture or not. 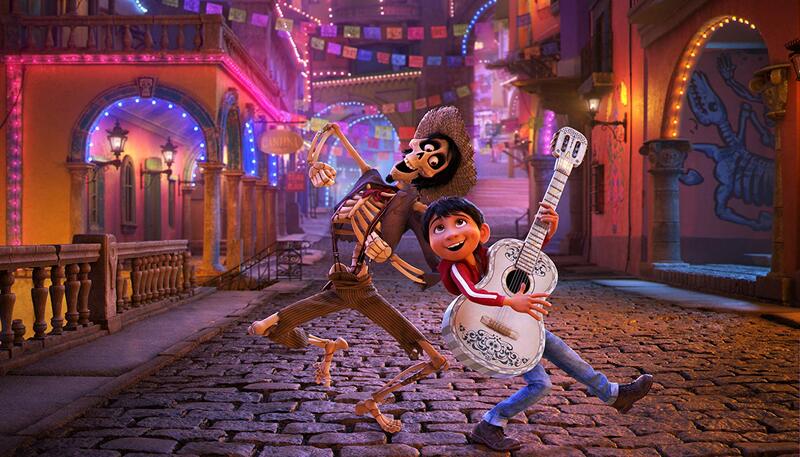 Certainly, the film gives clear impression that a great deal of effort is being made to do so, something paid out by the fact that Coco became the second highest grossing film in Mexican history. And a quick query among Mexican friends indicates that the film was enormously well received in the country and that people proudly spoke of it representing their heritage. Coco is an extraordinarily colourful film. Once we arrive in the Land of the Dead, the surroundings burst with every single colour of the rainbow (frequently all in the same frame at one time). 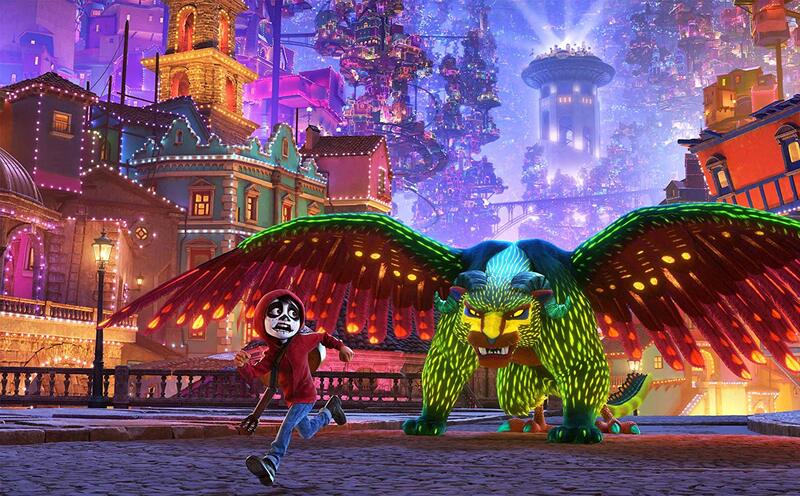 As with all the enjoyable Pixar films, it is always worth watching the background for little gags – the skeletons with their constantly detachable skulls and bones – and secondary characters that gain their own life – especially Miguel’s dog that partway through turns into an animate alebrije (which incidentally is not a traditional afterlife spirit but were actually figures created by artist Pedro Linares following a fevered illness that have since caught on with the public). 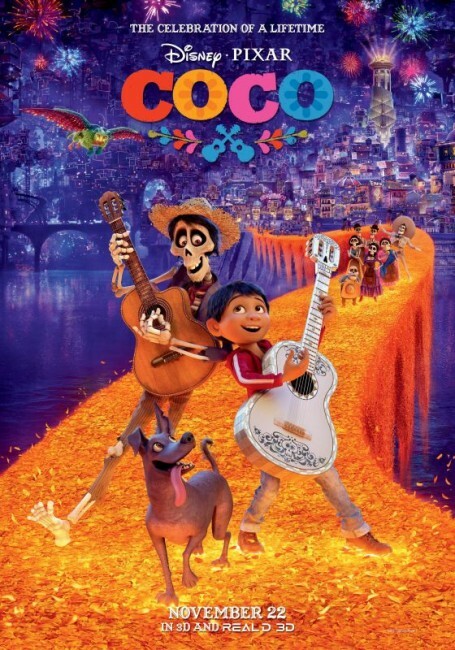 It’s enjoyable in all the right places and Unkrich gives just the right tearful and saddening spins to scenes like where the Edward James Olmos-voiced Chicarron passes away because he has been forgotten and especially at the end where Miguel is inspiring Coco to try and remember the song of her childhood. Maybe I am just more jaded from seeing too many bad and formulaic mainstream animated films – anything from Blue Sky, for instance – or too many Pixar sequels that have proven to be lesser than their predecessor, but I am not enjoying Pixar films as much as I unvaryingly did until Up. In particular, I felt the big mid-film spin [PLOT SPOILERS] that Miguel’s great-great-grandfather wasn’t the person he expected and the sudden relevance of a heretofore overlooked character was all a bit predictable in its reversals. There’s nothing there that held any surprise – or maybe it was the fact that the great-great-grandfather was never named by any of his descendants and had the face torn off the photo that acts like a big red neon sign that the revelation is going to be a guessing game – and all of the twists fall into place with a predictability.